On 4 December 2015, Metropolitan Hilarion of Volokolamsk, chairman of the Department for External Church Relations of the Moscow Patriarchate, arrived in Sofia with the blessing of His Holiness Patriarch Kirill of Moscow and All Russia to take part in a meeting of the joint commission of the Russian and the Bulgarian Orthodox Churches on the canonization of Archbishop Seraphim (Sobolev) of Boguchar. 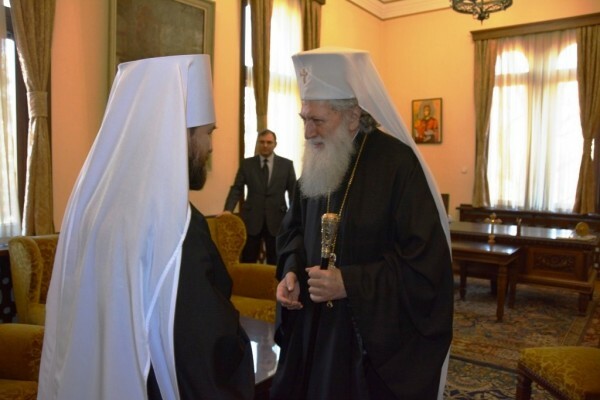 At the residence of the Holy Synod of the Bulgarian Orthodox Church, Metropolitan Hilarion met with His Holiness Patriarch Neofit of Bulgaria. They were joined at the meeting by Metropolitan Joan of Varna and Veliki Preslav; Archimandrite Gerasim (Georgiev), chief secretary of the Holy Synod of the Bulgarian Orthodox Church; and archpriest Igor Yakimchuk, secretary for inter-Orthodox relations of the Moscow Patriarchate’s Department for External Church Relations. The participants in the meeting discussed bilateral relations between the Russian and the Bulgarian Churches and some issues of pan-Orthodox importance. His Holiness Patriarch Neofit presented to Metropolitan Hilarion a panagia with an icon of St John of Rila. The DECR chairman, on his turn, presented the Primate of the Bulgarian Orthodox Church with an album containing photos of pre-revolutionary Russia made by a photographer Sergey Prokudin-Gorsky (1863-1944). Accompanying Metropolitan Hilarion on his visit are archpriest Igor Yakimchuk, DECR secretary for inter-Orthodox relations, and Mr. Alexander Yershov, assistant to the DECR chairman.